At the International Sociological Association’s World Congress of Sociology 2018, I had the pleasure to meet Zoe Baker, who wrote her PhD thesis on „The Higher Education decision-making and choices of underrepresented Further Education students in England„. In her research, she adopted diary methods with young people and discovered that co-participation achieved a number of benefits. 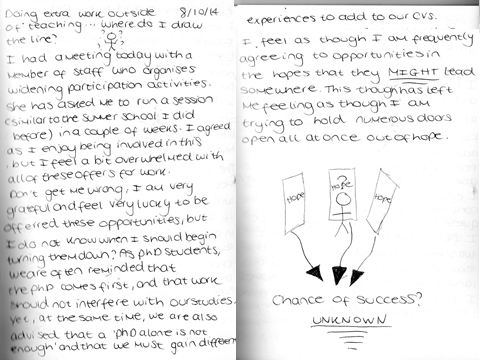 In the following blog post, Zoe explains how she co-participated in diary methods with participants, and details the advantages of this approach. Dr. Zoe Baker is currently based at De Montfort University, Leicester, where she works as a Lecturer in Learning Development. The following post uses data from an Economic and Social Research Council funded PhD study (Baker, 2017) which longitudinally explored Further Education1 (FE) students’ Higher Education (HE) decision-making and choices in England. Using narrative and co-participatory approaches, the research aimed to capture participants’ HE decisions and choices over the duration of their FE studies2. In this post, I reflect on my experience of utilising diary methods as a means of co-participating in the research. I detail a number of benefits that emerged from this which were unforeseen at the outset of the study, and make a case for the usefulness of employing diary methods with young people in qualitative inquiry. Diary methods were employed as they were compatible with the aims of the study; I wanted to gather a longitudinal narrative picture of the participants’ educational decision-making and choices. Although face-to-face methods such as semi-structured interviews and focus groups were also regularly conducted over the two year data collection period, it was not logistically plausible to conduct these more frequently without causing disruption to the participants’ educational commitments. Diary methods, therefore, provided a means of capturing participants’ experiences continuously over time without the need for me to be physically present. In the early stages of the data collection period, participants verbally expressed concerns about completing their diaries. These consisted of: 1) Fears of writing the ‘wrong thing’, 2) apprehension over writing ‘enough’ in terms of the length of entries, and 3) feeling that diary completion was ‘all or nothing’; in cases where participants had not written consistently, they sometimes assumed that they had ‘failed’ at the task which led to decreased motivation to continue. Even though I provided frequent verbal encouragement and reassurance to participants in an attempt to subdue these concerns, this was not always enough. I suspected that their apprehension may have been informed by the familiar experience of having their writing scrutinised regularly as part of their education. 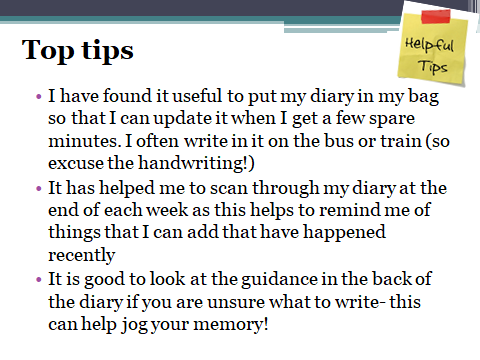 When considering new approaches to better reassure participants of their own diary-keeping abilities, I decided that it would be beneficial to keep a diary myself. This idea arose partially from the participants themselves, as they often asked me what I planned to do when I completed my PhD. 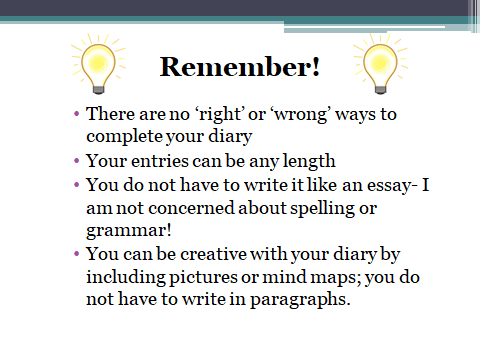 I also felt that this would provide reassurance to participants that there was no ‘wrong’ way to complete their diaries; I purposefully ensured that my entries were presented in different ways, including written entries, mind maps, bullet pointed lists and illustrations to communicate this message. I frequently shared my diary with participants by creating ‘Diary Update’ documents at regular intervals. These included copies of my own diary entries, as well as tips and advice on diary-keeping. Co-participation with diary-keeping produced several expected and unexpected benefits. It accomplished my intended aims of reassuring participants about their concerns of writing the ‘wrong thing’, not writing the ‘correct’ amount in terms of length, and not making entries frequently enough. In being able to share my own entries with participants, the diary-keeping aspect of the research became viewed as a shared practice, rather than a ‘task’ they were obligated to fulfil. Keeping my own diary also meant that I experienced some of the common challenges cited by participants, such as dedicating time to making entries, and writer’s block. I was then able to formulate additional advice and guidance to assist with the process which I disseminated to participants alongside extracts from my own diary. Additionally, unforeseen advantages emerged from co-participation. One such advantage was the creation of opportunities to build rapport through the sharing of personal stories. 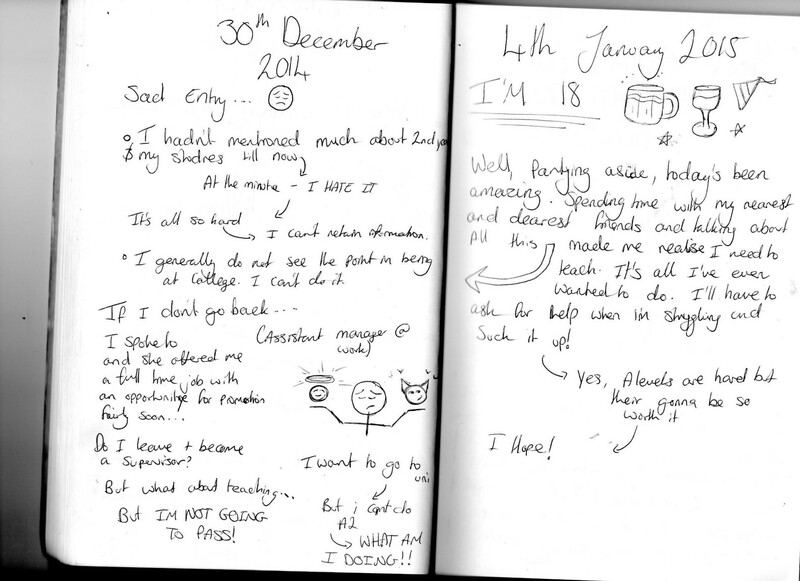 Through my diary, the participants learned of my journey into HE, and how my experiences as a PhD student influenced my thoughts about the future. The sharing of stories between the researcher and participant are particularly important for ‘building bridges in research relationships’ (Goodson and Gill, 2011: 27). Creating an accepting culture around the exchange of stories may have informed the level of detail participants were willing to communicate to me via their entries; for instance, some participants shared deeply personal aspects of their lived experience to demonstrate how these influenced their HE decision-making and choices. Additionally, participants may have viewed their diaries as a less ‘risky’ method of sharing stories that they felt unable to during face-to-face discussions, as there was no opportunity for others to react or respond. 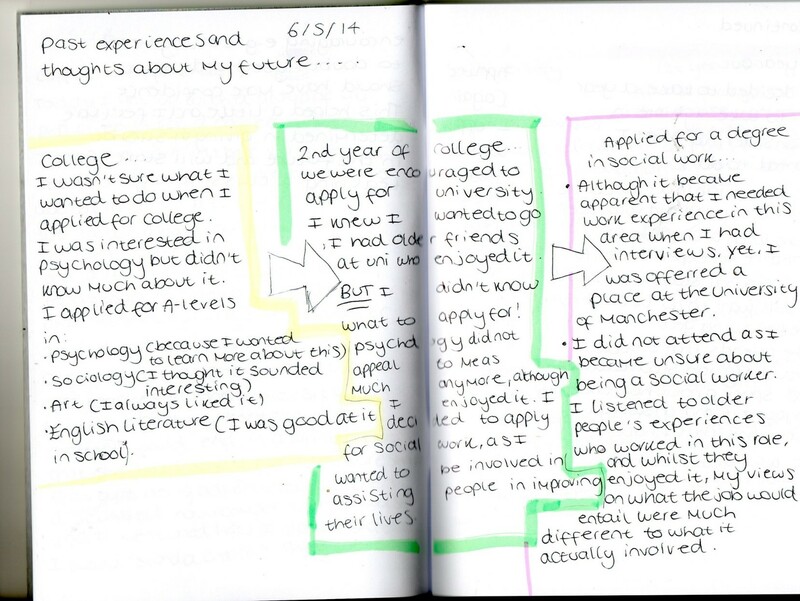 Co-participation in diary methods with young people was incredibly valuable. The process of writing a diary myself conveyed the message to participants that there was no ‘right’ or ‘wrong’ way of approaching this. This worked to reassure participants in their own diary-keeping abilities, and encouraged sustained engagement with the research over time. Additionally, sharing stories resulted in strong researcher-participant relationships. This proved advantageous for the depth of the data collected, with participant diary entries providing more detail to the stories shared during face-to-face methods3. Further Education colleges provide courses (typically vocational) to 16-19 year olds and adult learners. All participants were studying courses in FE that would qualify them for entry into HE. These courses were two years in length. For a more in-depth account of the advantages and challenges of adopting diary methods with young people, see: Baker, Z. (forthcoming) ‘Young people engaging in event-based diaries: Advantages and challenges’. In: C. Aliagas Marin & D. Poveda Artefacts for collaborative research with children and youth. E&E Publishing. Baker, Z. (2017) ‘Making their way’: The Higher Education decision-making and choices of underrepresented Further Education students in England. PhD Thesis. The University of Sheffield. Goodson, I. F. and Gill, S. R. (2011) Narrative pedagogy: Life history and learning. New York, Peter Lang Publishing. We found your article particularly interesting. To increase its visibility so the community can more easily appreciate it, we made it a headline article on the en.hypotheses.org slider.